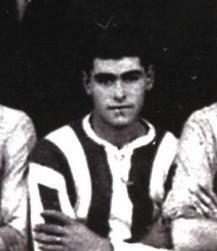 Carmelo Cauchi – match-winner for Floriana in a league decider against Sliema in 1927. In 1926-27, the championship was contested by only four teams. The first two matches of the competition, Floriana vs Valletta and Sliema Wanderers vs St George’s, ended in 0-0 draws. These two games showed the equilibrium that existed between the leading clubs. The third match was played on December 20, 1927 between Floriana and St George’s. Old memories and ancient feuds were revived when the old rivals met at a packed Empire Sports Ground. Floriana kicked off and for the first 20 minutes forced the Saints back into their own half. Then, a spectacular Tabone goal served to awaken St George’s to their responsibilities and for the rest of the game, they shared the exchanges. Both defences passed through many anxious moments but at the end the result remained unchanged. In those days it was rare to see a goal scored by combined attacking. The forwards were marked man-to-man and the midfielders were defenders in the true sense of the word. And so most of the games were end-to-end affairs, till a defender faltered in his clearance and the alert sharpshooter blasted it into goal. That is what happened in the game between Sliema and Valletta. A goalless stalemate looked on the cards but, on 66 minutes, Valletta’s Johnnie Perrin erred in leaving his post to clear a high centre. Frankie Busuttil managed to get his head to the ball and netted. A few minutes later, in a melee on the Valletta lines, the ball passed through a City player’s legs to Teddy Holland who promptly banged it into the net – 2-0 for Sliema. On March 13, St George’s lost all hope of winning the championship when they drew 1-1 with Valletta. The last match of the league therefore became a decider between the Wanderers and the Greens. The game was played on March 20, 1927. The powers that be were fully aware of the magnitude of the occasion and decided to entrust the game to Lieutant Blease of the Royal Artillery whose firm handling and impartial decisions were never questioned. After a goalless first half, Alex Calleja handled on the Sliema goal-line. George West made no mistake from the resultant penalty to give Floriana the lead. A few minutes later, however, Holland swung the ball across the Greens’ goal and Pisani fired home to make it 1-1. Both teams attacked in turns but without scoring until Carmelo Cauchi finally broke the deadlock with a clever back-heel to give Floriana the points and the championship. Pandemonium reigned among the Floriana supporters. The feature of the decider was the way Busuttil was marked out of the game by West. The inability of the Sliema star to shrug off his marker was the main talking point of a classic encounter. West and the diminutive Cauchi were outstanding for the Greens while Pisani was the best player for the Wanderers.